Too long had I sat in the shadows…not anymore. I am, after almost 3 years of converting dozens of people to the Mac, finally the owner of a blazing fast MacBook Pro and boy am I lovin' it! This is another one of those features which makes Apple products something to die for - a backlit keyboard with ambient light sensors which turn the backlight on automatically when it goes dark! Update : Added a 'broader' view. oye!! it's hard to make out if the white are rays of light or white colour u gotta let it be along side some unlight portion as well!!!! oopsy that anonymous was me!!! i want a broader view!! Hope the one below makes it easier to differentiate the rays of light coming from down under. yipppppey!!!!! now it looks nice!!!!!!!!!!!! n thanks for taking this pic!!!! I hope that one day I will make such a post too! Veeru we ALL hope that one day, some day... you make a post like this. Gosh, jealous is the friggin word. Probably I paid much morefor this laptop than it would have cost anywhere else in the world (Leave Somalia and India) and then on top of it had I waited a couple of months I would have got the C2D MBPs, heck. What are your specs? Will they be shipping Leopard to you when it is released? Anyways congratulations! Don't be disheartened Aditya. Australian and Indian prices of Apple products are more or less the same (not taking into account the education discount). As for missing out on the C2Ds..there's always going to be something better released in the next few months. I've got the stock 2.33GHz / 2GB RAM 15.4 inches model. I doubt they'll ship Leopard to me for free unless it is released before / during the first week of April. Can't leave this to be the only one without a comment from me! And well i dont know if it's just me and my distorted eyes.... 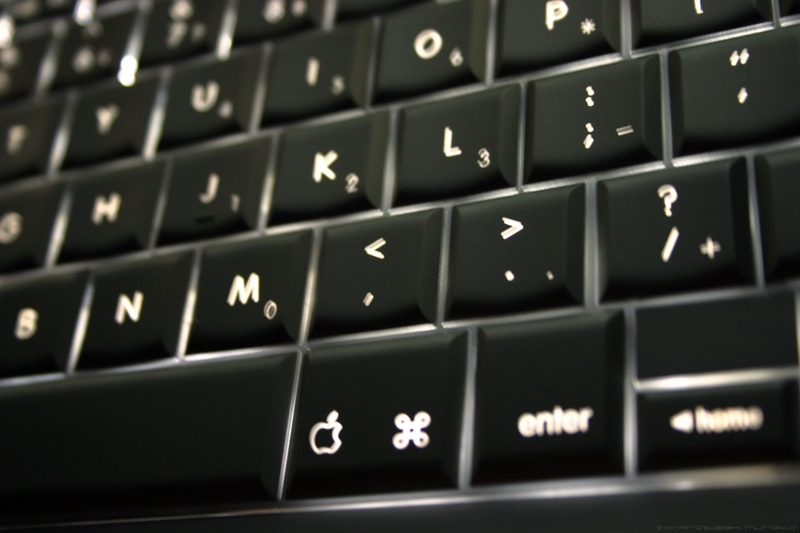 But i like that all the other keys are kinda blurred with the exception of the apple. Well the ambient light feature sounds and looks just awesome. Yup Rashmi - posts on my photoblog would be incomplete without a comment from you!